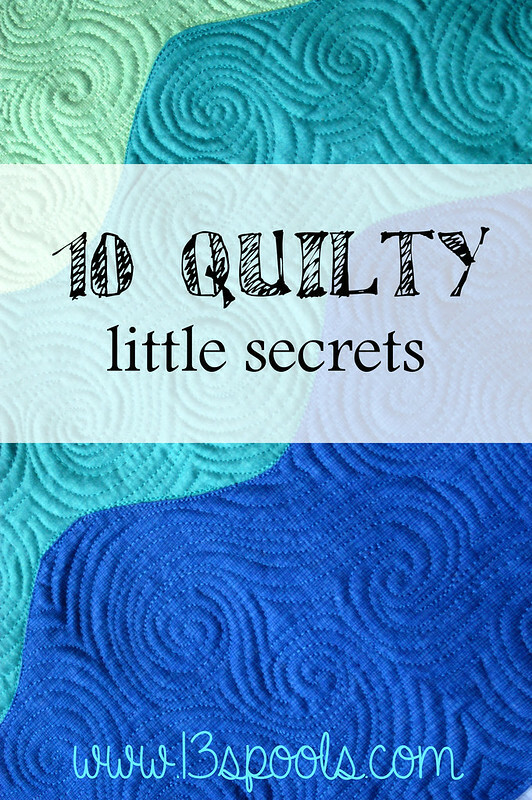 Amy, of 13 Spools, has started a flood of quilty confessions with her post "10 Quilty Little Secrets." Have you seen all the fun posts popping up as other bloggers share their own quilty secrets? I've decided to join in the fun too. 1. Like Amy, I iron my seams. I don't press them. I've tried, but I always revert back to ironing. 2. I rarely change my sewing machine needle. I can't justify changing it more often when I never notice a difference when I do bother to change it, and leaving the old needle in never causes me problems. 3. I almost never know who designed the fabric I'm using. 4. I sew on a Kenmore machine that I love. I feel no desire to 'upgrade' to a Bernina, Janome, Juki or any other, much more expensive, machine. This machine does everything I need it to do, and probably stuff I haven't decided to try yet. 5. I can't remember the last time I changed my rotary cutter blade. I probably should do that soon, it isn't cutting as well as it used to, but I never think to buy a new blade. 6. I just finished piecing a top with a jelly roll that I didn't prewash. It makes me jittery. I always prewash my fabric so now I feel like something bad is going to happen to this quilt the first time I wash it. I'm buying colour catchers as soon as I can actually find some in a store. 7. I don't save my selvages. Some people make beautiful things using selvages, but I'm not one of them. 8. I used to desperately want a longarm, but now I think I wouldn't buy one even if it could fit in our budget and our house. Leah Day is right, you don't need a longarm to do fantastic free-motion quilting. 9. I don't like large scale prints, or prints with lots of colours. I never know how to use either of them. 10. Improv holds no appeal for me. There you have it, all my quilty little secrets. What are yours? Share them in the comments, or write up your own post and link it to Amy at 13 Spools. The only time I change my sewing machine needle is when my machine gets super fussy when I am free motion quilting. Unfortunately, that seems to be all the time at the moment... but I'm sure I'll find her sweet spot one of these days. :) I don't save selvages, either. Heck, I rarely save much of my "scraps" unless it is significant enough to use for another project! I have really enjoyed reading everyone's lists. Hi Leanne! When my rotary blade starts wearing down, I get a bit more life from it after cuttong through some folded layers of aluminum foil. I like to extend the life of everything too, and I have oodles of selvedges that I will probably never use, taking up precious space. They may be posted at my Etsy site soon! Or, maybe they would make a good giveaway. love your list, I agree with #1 and #10 totally!!! I like going to the different blogs and seeing some of the different outlooks on quilting. It is very liberating. I actually had some trouble narrowing it down to just the ten. Thanks for sharing. Oh yes, I recognise most of those....you mean you can get new blades for a rotary cutter? Who knew!